Biography: Ian McAllister is an award-winning photographer and author of many books, including A Whale's World, The Seal Garden, Wolf Island, A Bear's Life, The Salmon Bears, The Sea Wolves and The Great Bear Sea (all with Nicholas Read). He is the founding director of Pacific Wild, a Canadian nonprofit wildlife-conservation group. He lives with his family in the heart of the Great Bear Rainforest. For more information, visit pacificwild.org. 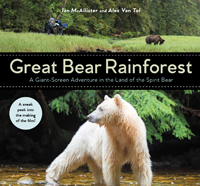 Go behind the scenes in the land of the spirit bear.